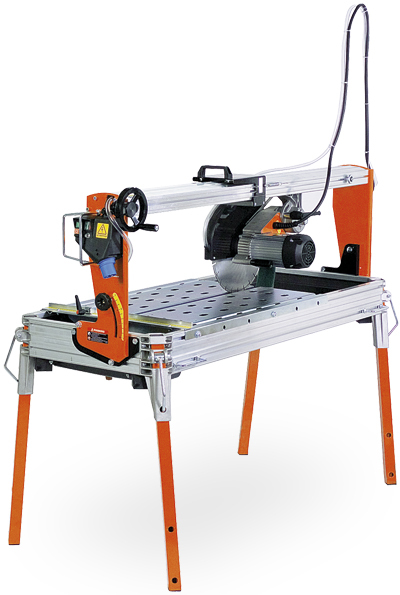 PRIME is a bridge saw ideal for the building sector. New design with vanguard technical innovation, strong and precise, it is suitable for cutting bricks, stones, concrete blocks, granite, marble, slabs. It is built to work with diamond disk Ø350 mm. Three phase engine available upon request. Alluminium draw-plate to get the maximum of rigidity and lightness at the same time. The rail is in extrusion of aluminium at high resistance to the torsional stress. It’s equipped with interchangeable stainless steel bearings-tracks. Millimitres graduated scale for a fast execution of the cuts in series. A professional adjustable goniometer fence is included. The extension side table, made in galvanized steel, is optional and can be mounted in both the sides of the machine. It allows the cut of big sizes. The carriage engine group slides on the rail by means 8 ball-bearings, of which 4 works always in perpendicular way respect to the rail. So doing the sliding is very fast and precise. The wiring of the cables is integrated inside the rail to avoid they interfere in the cutting area. Powerfull engine 3Hp / 2,2 KW with thermal and amperometrical protection. The adjustment of the cutting depth occurs by means the locking of the tilting of the engine group. A simple and easy graduated scale measures directly the cutting depth. The working table, of large dimension (620 mm. ), is made in galvanized steel. The water tank, realized in abs material, crash and consumption proof. – It’s easy to clean and realized to divide the cutting rubble from the recycling water’s area. – Water recycling pump type S2 included.